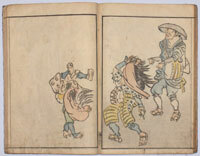 A hosoban showing the actor Ichikawa Monnosuke II standing before a torii and looking down at a snake. 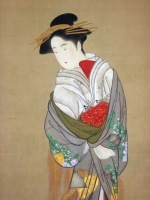 Not listed in the Riccar Art Museum Exhibition Of Ukiyo-e By Ippitsusai Buncho, 1978. 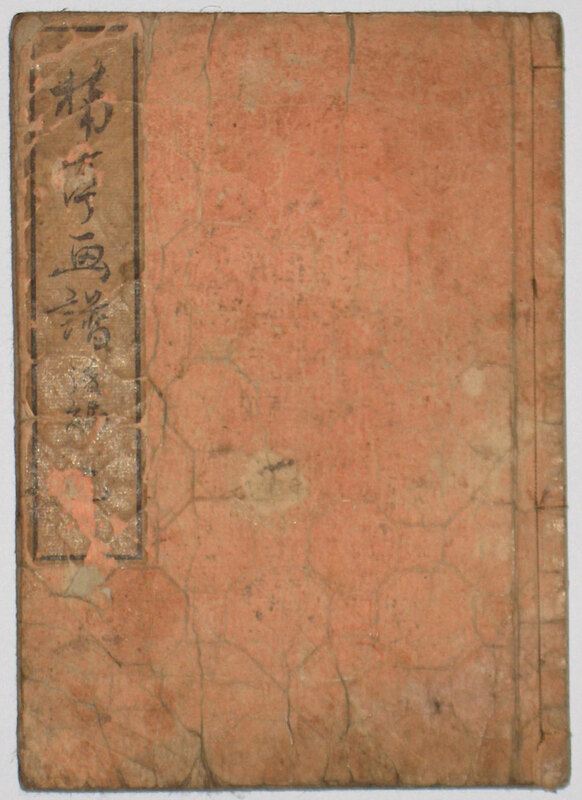 Published c 1769. Very good impression. Extremely well preserved colour. Probably slightly trimmed on right and slight soil, otherwise very good condition. 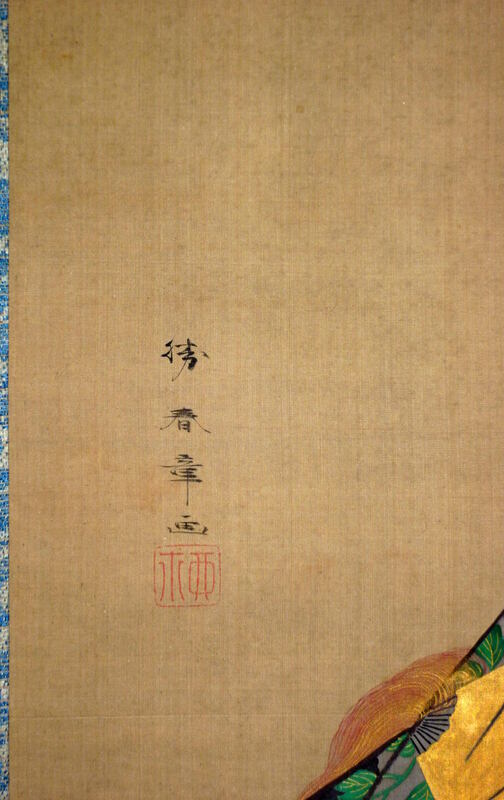 Signed Buncho ga.
A hosoban showing the actor Ichikawa Raizo II as Kanesashi Goro Katsuhide in the play Kawaranu hanasakae hachi no ki, “The Ever-Blooming Potted Tree.” Performed at the Nakamura-za Theatre in 11/1769. 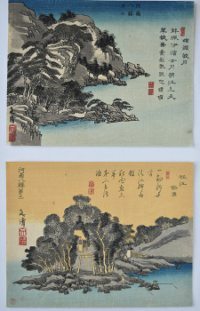 Extremely rare: Another impression is illustrated in an Exhibition of Ukiyo-e by Ippitsusai Buncho, Riccar Art Museum, 1978, no. 40. 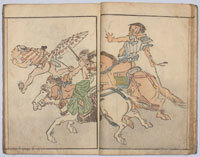 Their example is annotated on the top left: Meiwa 6 nen, kaomise, Kanesashi Goro, Ichikawa Raizo. The kaomise production was always in the 11th month and was quite literally the “face showing” of actors for the coming season. 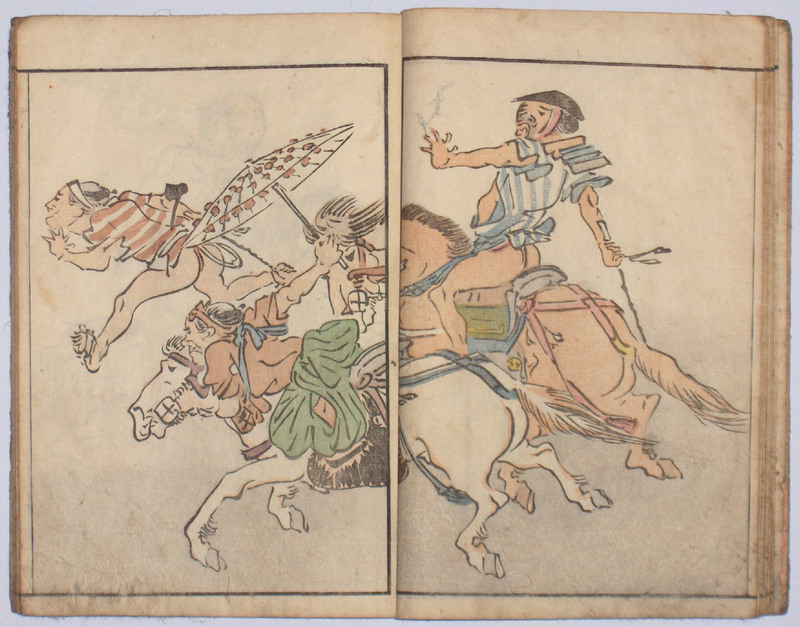 There are a considerable number of hosobans annotated in the same hand around this time – obviously by an avid theatre goer. Buncho was the pre-eminent designer of hosobans in the second half of the 18th century. He subsequently became a samurai. 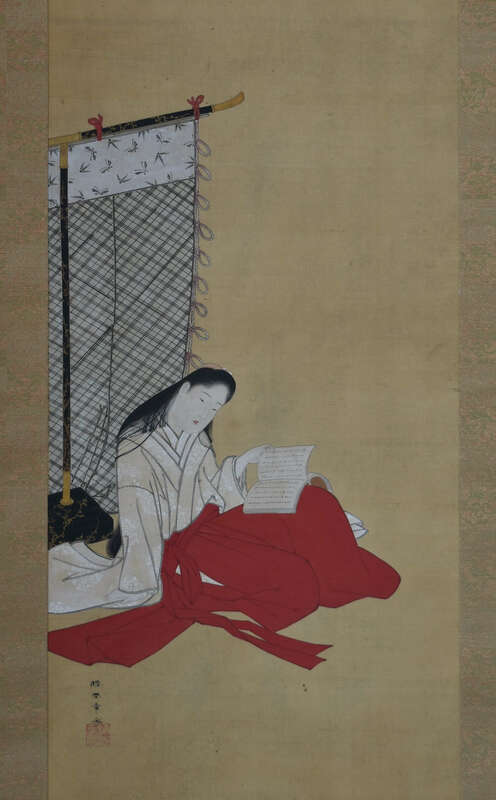 He was also a painter and, together with Shunsho, produced the fine three volume book Ehon butai ogi of stage actors in 1770. 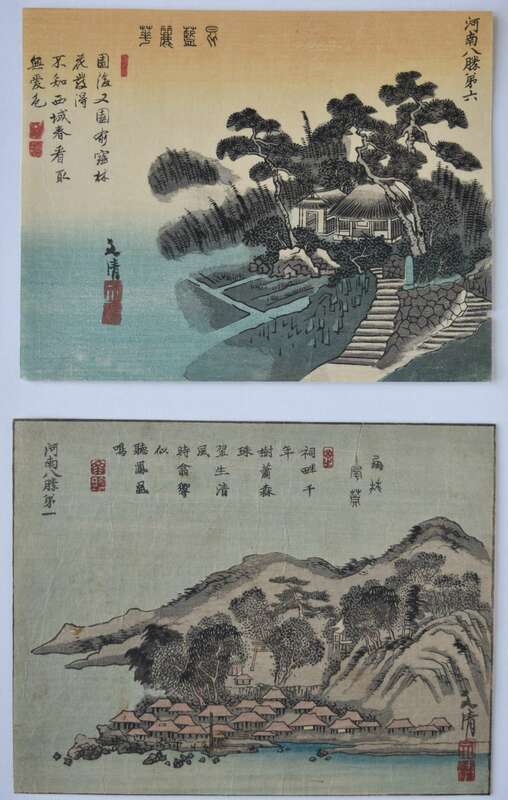 Superb impression, colour and condition: As the day it was printed. Signed Ippitsusai Buncho ga with seal Mori uji (offset as on the Riccar impression). Little is known of Buncho’s life. With Shunsho, he was the pre-eminent designer of actor hosoban producing them during the short period of 1766-1773. He also collaborated with Shunsho on the fine 3 vol. 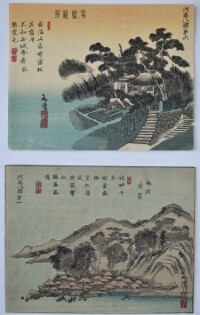 Ehon butai ogi in 1770. 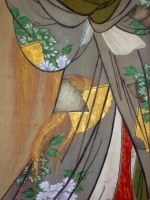 Shows the actor Nakamura Matsue I in an onnagata role holding a child beside a large bell. This is possibly Matsue playing Sakuragi, the wife of Munesada, in the play Kuni no Hana Ono no Itsumoji performed at the Nakamura-za Theatre in 11/1771. 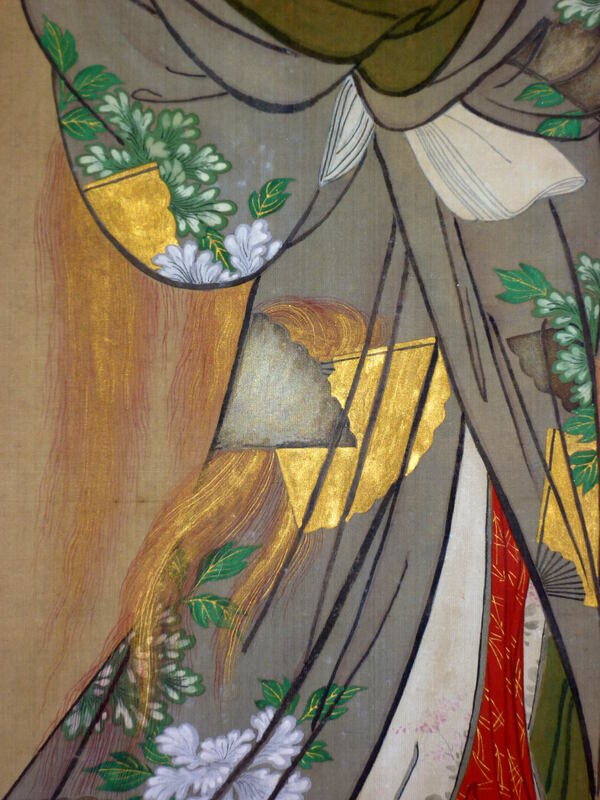 Provenance: Ex collection Ernest Le Veel. Sold lot 13, 3rd sale, Ader Picard Tajan, 5/11/1981. Seal au verso. 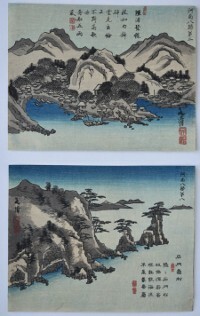 Rare: Not listed in Exhibition Of Ukiyo-e By Ippitsusai Buncho, Riccar Art Museum, 1978. Fine impression. Very good colour. Fine condition. Signed Ippitsusai Buncho ga with Mori uji seal. 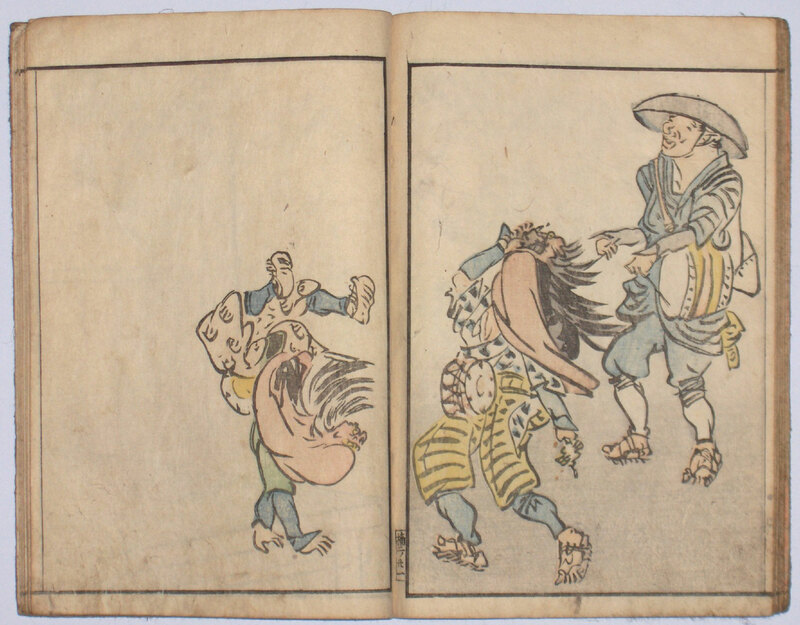 Ichikawa Danjuro V probably as Watanabe Kiou Takiguchi in the play Nue no mori ichiyou no matsu performed at the Nakamura-za in the 11th month of 1770. It was in this month that Koshiro III took the name of Danjuro V. Shows Danjuro in the iconic costume of the Shibaraku scene with the giant mon. 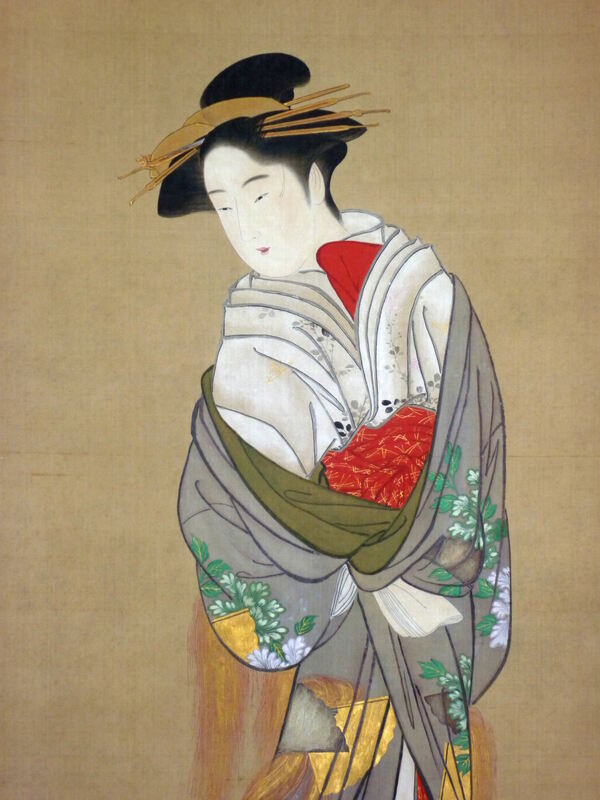 Buncho was a connoisseur of paintings ( he wrote Buncho gadan [ Treatise on Painting ] ), and was one of the most important painters and print designers of this period. A fine design and extremely rare. Fine impression. The background probably “turned” from a pale blue ( as usual ). Trimmed into signature at left, otherwise very good condition. 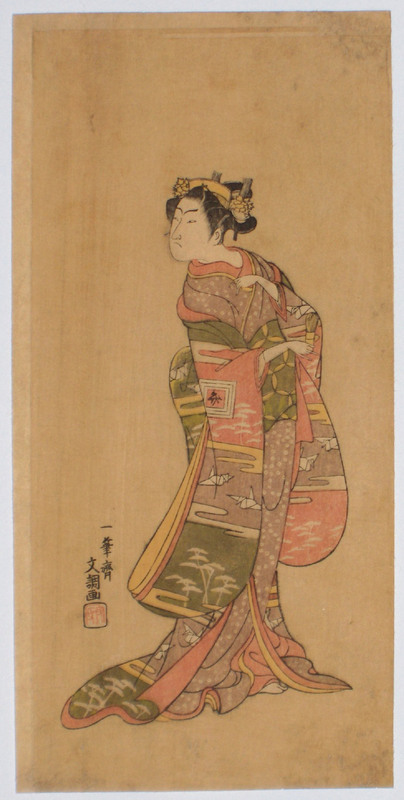 Signed Ippitsusai Buncho ga.
A chuban print showing a beauty standing on a balcony adjusting a comb in her hair. She gazes at a ferry crossing the Sumida River in rain. 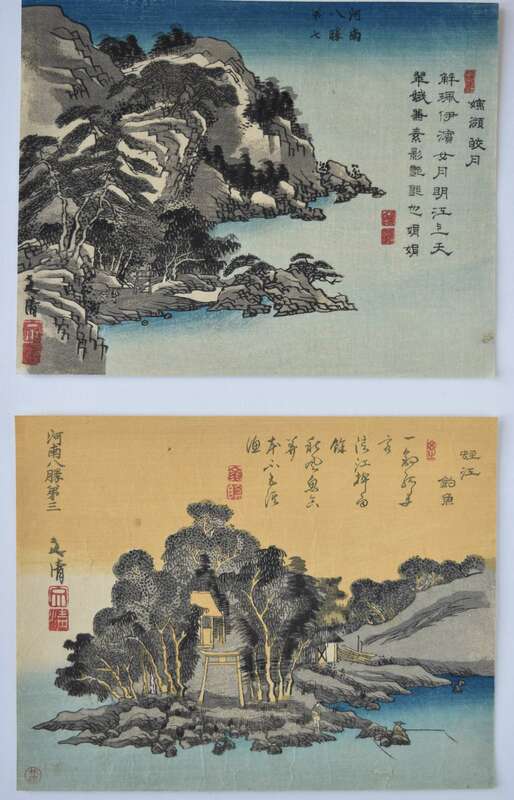 One of a series with title on an ink-cake top right: Bokusui hakkei, “Eight Views of Inky Water” ( “Inky Water” being the colloquial term given to the Sumida River ); sub-title: Hashiba no yora no ame, “Evening Rain at Hashiba.” Ex Gonse collection, first sale, no. 13, pl. 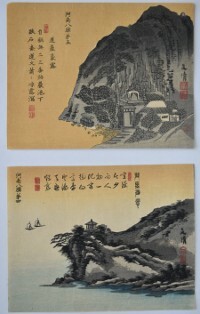 2 ( seal au verso ) and Vever collection, Sotheby & Co, Part II, 1975, lot 101 ( seal bottom right ). Extremely rare. A much trimmed impression is in T.N.M., vol. 1, no. 827. Fine impression. Some “turning” of colours, otherwise very good condition. Signed Ippitsusai Buncho ga with Mori uji seal. 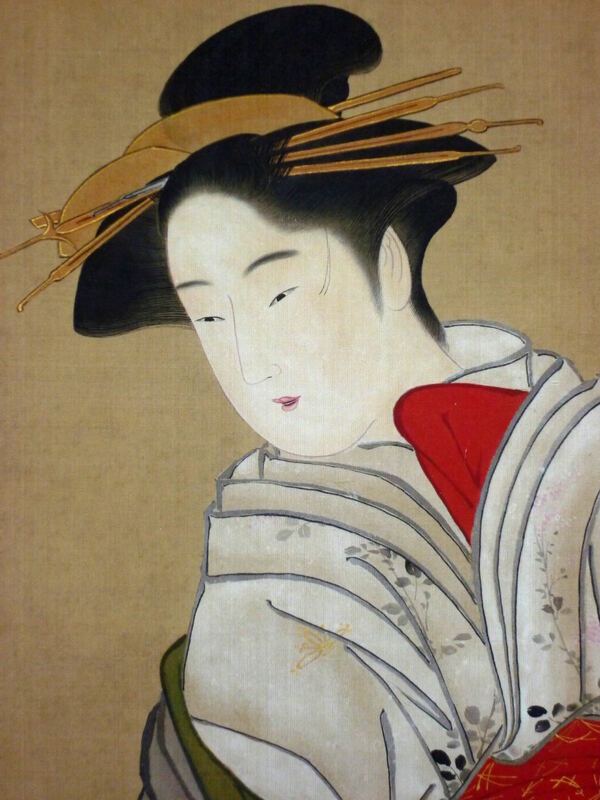 A fine full length hosoban portrait of the actor Ichikawa Benzo I in the role of Kuretake in the play Tenjiku Tokubei kokyo no torigashi performed at the Nakamura-za in the 8th month of 1768. 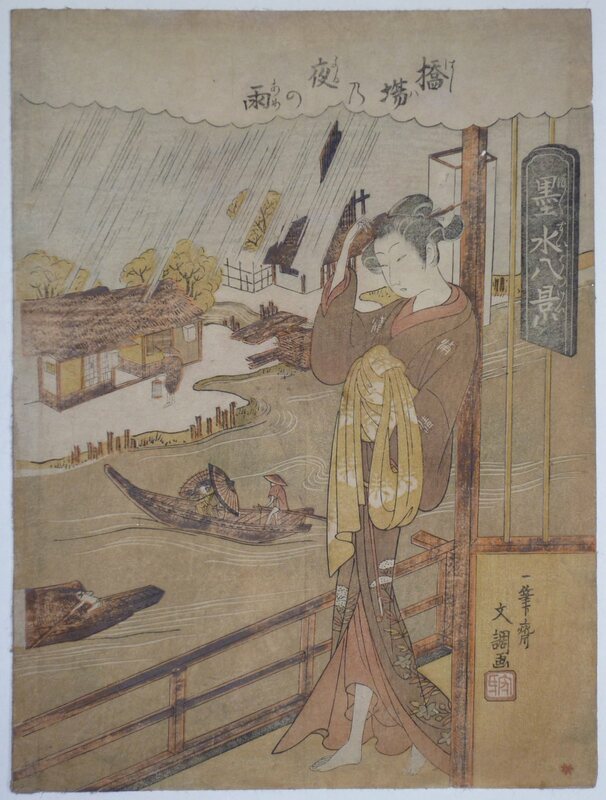 A very damaged example is illustrated in Exhibition of Ukiyo-e by Ippitsusai Buncho, Riccar Art Museum, 1978, no. 23. Very good impression. Background turned, otherwise very good colour. Slight toning, otherwise very good condition. Signed Ippitsusai Buncho ga.
A complete set of Eight Views of Xiaoxiang, modern Hunan Province, China. These eight views were taken up by Japanese artists such as Hiroshige and transposed to Japan becoming sets like the Eight Views of Omi, etc. 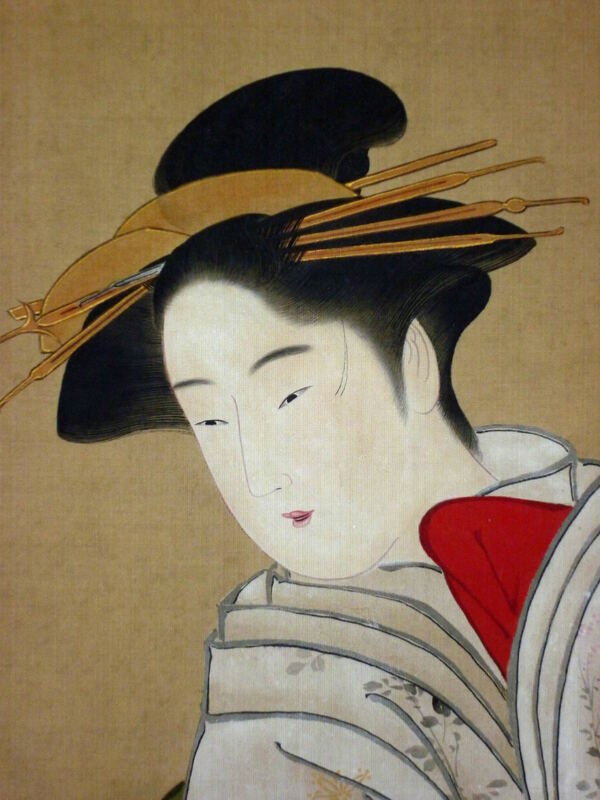 Bunsei was a pupil of Tani Buncho. He seems to have made a speciality of this subject and there is a slightly larger version set of the same subject. Published c. 1830s. Provenance: Ex Hayashi with his seal on most of the designs. Rare complete. Very good impressions and colour. Minor edge wormage, othwerwise very good condition. Each signed Bunsei. 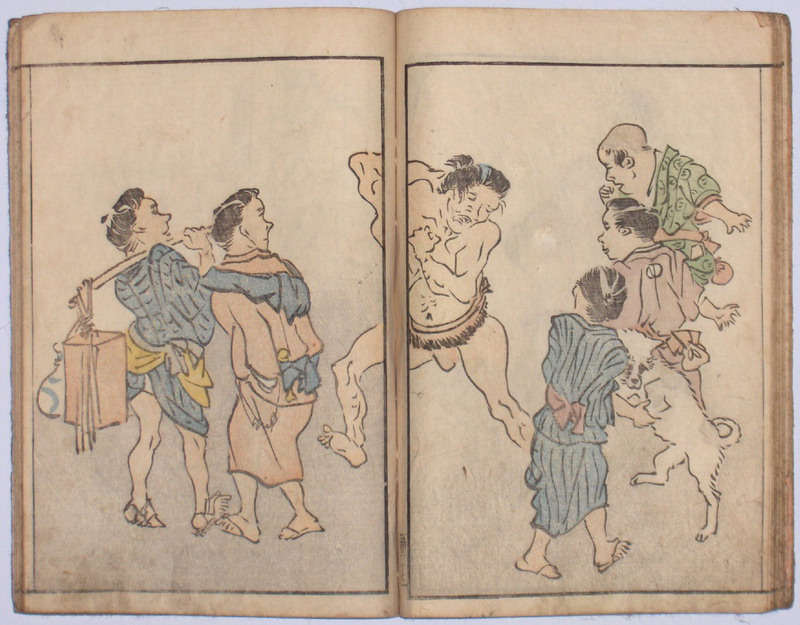 One volume complete Nantei gafu kohen, “A Book of Drawings by Nantei, Second Part.” Also published as Jimbutsu gafu. 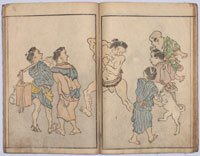 Published by Bunchodo ( Yoshida Shimbei ), Bunsei 9 ( 1826 ), the preface dated Bunsei 6 ( 1823 ). Fine designs of everyday life in the Kyoto area. 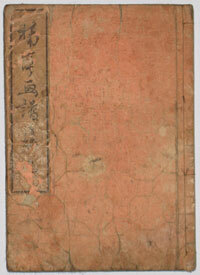 Original light orange covers and brown title slip. Some wear to covers. Slight thumbing to lower corners, otherwise a nice copy.